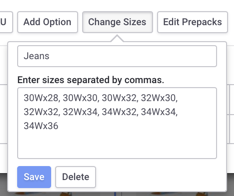 This article refers to a special display option for Sizes with 2 variables (e.g Waist x Inseam) on an Order Form. It is a helpful alternative to offering Sizes in a single row, which is the default for Products on Brandboom. Note: If you are looking to set up "Size Grids" on your Presentation PDF to display Options and Sizes, see Presentation PDF Settings instead. In the example here, you can see that Inseam lengths are displayed along the horizontal axis and the Waist lengths are displayed on the vertical axis, allowing the Buyer to pick and choose which combination of values they want. Here the Buyer is ordering 1 unit of "Indigo" in Size "32Wx32." See Add Sizes to a Product (Size Chart) for basics of how to add a Size Chart to a Product. When listing your Size values, make sure to use the letter "x" to separate your 1st and 2nd variables. The system will not trigger the Matrix display with any other special character (e.g. /, -, etc.). Note: 1st variable will display along vertical axis. Swap the position if you want to change. When applied, you will see the values displayed in a single row in the SOS Edit interface, like normal Size values. On the Order Form, however, the values will correctly be split along the axes.